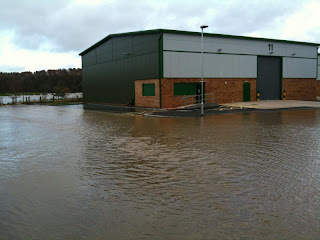 Following four days of heavy rain last week, Bitter End Brewing Co's new brewery site to which we moved less than one month ago -Derwent Mills, in Cockermouth was surrounded by floodwater and inaccessible to those without water skis, or an ark. We waded across on Friday, as the water level began to fall, in order to asses the extent of the damage, and I am relieved to report that the new premesis resisted the best attempts of the river to get in and very little damage occured -We're very fortunate that the brewery is housed a hundred yards upstream of the confluence of the Derwent and Cocker where the worst flooding took place. Had we been a few yards downstream it could have been a very different story. We've been brewing fine beers again this week for bottle and for cask, and remain open for business. It's strange to be cut-off from the town -the only foot bridge washed away and the road bridge closed, pending structural assesment. There have been some exciting developments at the brewery in recent weeks of which I will do my best to keep you abreast off...the development of our first ever India Pale Ale -Lakeland IPA -5.5%ABV -get down to the Round Table Beer festival in Cockermouth next weekend for a taste. Keep your eyes open for a special bottled version too! In addition to IPA, there will also be two more additional brews available at your local farmers' market or foodhall -Visit www.bitterendbrewingco.com for detail and more of the latest news. 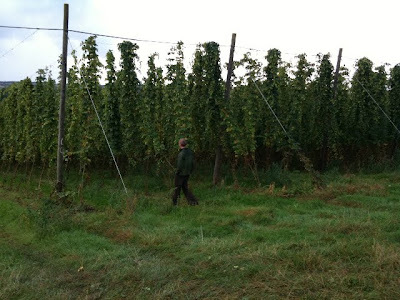 On the first day of September, Bitter End Brewery owner Mike and Brewer Steve, paid a visit to Pridewood Farm in Ashperton, Herefordshire at the invitation of hop merchants Charles Farhams. Farhams, based just the other side of the Malvern Hills were eager to show off the new state of the art hop kilns that have been installed at Pridewood after the old brick and timber kilns were badly damaged by fire during the 2007 season...The new kilns incorporate a greater degree of automation, reducing some of the manual work that was associated with the old kilns. 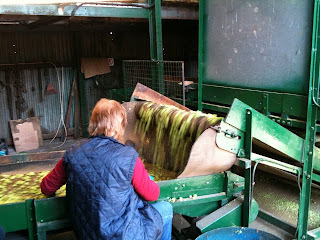 The drying process itself too is computer controlled thus ensuring a better quality of end product although Pridewood's farmer Martin Powell-Tuck is still up to the early hours to keep a watchful eye over his hops -on this day, the first day of the 2009 harvest, it was Goldings that was being brought in. 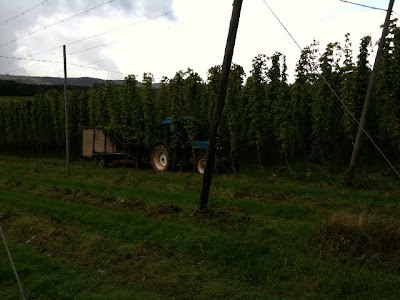 It is a wonderful sight to see the bines being cut out in the field, brought by trailer to the picking shed where the hops are stripped from the bine ready to be conveyed to the kiln where they're spread over the large floors and dried such that moisture is reduced by as much as 90%. Drying the hops increases their storage capacity, vaccum packed so that the characteristcs which make Humulus Lupulus prized to such a degree by brewers are preserved, so that they may be used the whole year round. Drying however is not nesescary for the hops to be used in a brew and we were able to obtain a quantity immediately after picking and before kilning -5kilos of the first Goldings of 2009. The hops were brought back to Cumbria and pitched to a very special brew within 24 hours of picking...keep your eye out in the Bitter End this week for G.H.B. (Green-hopped Beer) at 4% ABV -A very special beer available for a limited period of each year only. Firstly, may I say how good it is to be in touch and with excellent news after some period of time. The brewery has been operating at full steam for the better part of the last three months -mash tun full of the finest English malted barley Thomas Fawcetts can supply, copper boiling all steam and hops, fermenters fermenting, casks rolling. So now it is that I am able to grab a moment to let you know what has been going on. ...and keep your eyes peeled for very special one-off beers available only in the bottle. Something certainly to look forward to -keep an eye out at your local co-op...plans are also afoot for an online beer shop via www.bitterend.co.uk so fear not readers in the United States, but more on that later! Mild ale is a style which has come to be associated with low ABV beers, however mild ales were simply less heavily hopped beers than their more bitter relatives, and as such became a hugely popular style in the 19th century as the workforce driving the industrial revolution took to the malty brews as a means of restoring themselves after a long day of manual labour at the coalface. Many milds in common with most beers of old were brewed to a far higher O.G. than those of today, and some milds of today still follow this recipe -I encourage the dear reader with a curious pallette to seek out the wonderful Dark Ruby Mild, ABV 6%, brewed by the Sarah Hughes Brewery of Sedgley, West Midlands. Our own interpretation is packed full of Maris Otter pale and crystal malts, with a little chocolate malt and roasted barley...a real dark mild full of flavour with the English hop, Challenger in the copper and a good dose of whole flower hops added late, in the hopback. A fine beer to restore oneself after a long day at the grindstone, or on the fells! Enjoy! It's a joy to feel the temperatures return from the polar depths of January...the brewhouse is not well insulated from the cold, and low night-time temperatures mean a close eye must be kept on temperature of the beers in the fermenters -in a couple of the coldest spells we had, they've had their own electric heater in the brewery to keep them cosy through the night! ...I shall endevour to bring you more news of seasonl brews when there is such. In the meantime allow me to whet your appetite with the news that plans might just be afoot for a rather special blended beer, in the tradition of the porters of the 19th century...watch this space! We all know that it's hungry work being a passionate connoisseur of quality beers, and hard and thirsty work for those who are inflicted with a passion for discovering the best in quality locally produced, home-cooked food. Therefore it is with great pleasure that the Bitter End is able to help in some way, by the announcement of...Our first ever speciality PIE & PINT of ale festival, at the Bitter End. The Cockermouth beer festival next door in the Kirkgate Centre kicks off on Thursday, running through to Saturday, so pop in to the Bitter End on Thursday and Friday lunchtime, or all day on Saturday before 6pm for some very special pies and micro-brewed beer. Where is the Bitter End? Find the Bitter End Pub at 15, Kirkgate (off Marketplace) Cockermouth CA13 9PJ...Find the brewery at Unit 11, Derwent Mills, Cockermouth, CA13 0HT...And you can sample Bitter End beers at our other pub the Royal Yew, in the village of Dean, off the A5086 Cockermouth-Whitehaven road. This is the site for all things beer going on at the Bitter End...Keep your eye on this site for details of special beers in the fementers, and what's new in the world of the Bitter End Brewery.